1. The Self is not a philosophical idea, since it does not predicate its own existence, i.e., does not hypostatize itself. From the intellectual point of view, it is only a working hypothesis. Its empirical symbols, on the other hand, very often possess a distinct numinosity, i.e., an a priori emotional value, as in the case of the mandala, "Deus est circulus . . . ," the Pythagorean tetraktys, the quaternity, etc. It thus proves to be an archetypal idea . . . , which differs from other ideas of the kind in that it occupies a central position befitting the significance of its contents and its numinosity (CW 6 [Psychological Types], par. 789 - 791). 2. It is of the greatest importance that the ego should be anchored in the world of consciousness and that consciousness should be reinforced by a very precise adaptation. For this, certain virtues like attention, consciousness, patience, etc., are of the greatest value on the moral side, just as accurate observation of the symptomatology of the unconscious and objective self-criticism are valuable on the intellectual side (CW 9/2, par. 46). 3. Psychological truths are not metaphysical insights; they are habitual modes of thinking, feeling, and behaving that experience has proved appropriate and useful (CW 9/2, par. 50). 4. Although "wholeness" seems at first sight to be nothing but an abstract idea . . . , it is nevertheless empirical insofar as it is anticipated by the psyche in the form of spontaneous or autonomous symbols. These are the quaternity or mandala symbols, which occur not only in the dreams of modern people who have never heard of them, but are widely disseminated in the historical records of many peoples and many epochs. Their significance as symbols of unity and totality is amply confirmed by history as well as by empirical psychology. What at first looks like an abstract idea stands in reality for something that exists and can be experienced, that demonstrates its a priori presence spontaneously. Wholeness is thus an objective factor that confronts the subject independently of him, like the anima or animus; and just as the latter have a higher position in the hierarchy than the shadow, so wholeness lays claim to a position and a value superior to those of the syzygy [anima and animus]. The syzygy seems to represent at least a substantial portion of it, if not actually two halves of the totality formed by the royal brother-sister pair, and hence the tension of opposites from which the divine child is born as the symbol of unity. 5. Unity and totality stand at the highest point on a scale of objective values because their symbols can no longer be distinguished from the imago Dei. Hence, all statements about the God image apply also to the empirical symbols of totality. Experience shows that individual mandalas are symbols of order and that they occur in patients principally during times of psychic disorientation or reorientation. As magic circles they bind and subdue the lawless powers belonging to the world of darkness and depict or create an order that transforms the chaos into a cosmos. The mandala first comes into the conscious mind as an unimpressive point or dot, and a great deal of hard and painstaking work as well as the integration of many projections are generally required before the full range of the symbol can be anything like completely understood. If this insight were purely intellectual, it could be achieved without much difficulty, for the world-wide pronouncements about the God within us and above us, about Christ and the corpus mysticum, the personal and suprapersonal atman, etc., are all formulations that can easily be mastered by the philosophic intellect. This is the common source of the illusion that one is then in possession of the thing itself. But actually one has acquired nothing more than its name (CW 9/2, par. 59 60). 6. The shadow, the syzygy, and the Self are psychic factors of which an adequate picture can be formed only on the basis of a fairly thorough experi-ence of them. Just as these concepts arose out of an experience of reality, so they can be elucidated only by further experience (CW 9/2, par. 63). 7. Outside the narrower field of professional psychology, these figures meet with understanding from all who have any knowledge of comparative mythology. They have no difficulty in recognizing the shadow as the adverse representative of the dark chthonic world, a figure whose characteristics are universal. The syzygy is immediately comprehensible as the psychic prototype of all divine couples. Finally, the self, on account of its empirical peculiarities, proves to be the eidos behind the supreme ideas of unity and totality that are inherent in all monotheistic and monistic systems. 8. I regard these parallels to be important because it is possible, through them, to relate so-called metaphysical concepts, which have lost their root connection with natural experience, to living, universal, psychic processes, so that they can recover their true and original meaning. In this way the connection is reestablished between the ego and the projected contents now formulated as "metaphysical" ideas. Unfortunately . . . the fact that metaphysical ideas exist and are believed in does nothing to prove the actual existence of their content or of the object they refer to, although the coincidence of idea and reality in the form of a special psychic state, a state of grace, should not be deemed impossible, even if the subject cannot bring it about by an act of will. Once metaphysical ideas have lost their capacity to recall and evoke the original experience, they have not only become useless but prove to be actual impediments on the road to wider development. One clings to possessions that have once meant wealth; and the more ineffective, incomprehensible, and lifeless they become, the more obstinately people cling to them. This is unfortunately the fate of metaphysical ideas. 9. Today it is a real problem what on earth such ideas can mean. The world - insofar as it has not completely turned its back on tradition - has long ago stopped wanting to hear a "message"; it would rather be told what the message means. The words that resound from the pulpit are incomprehensible and cry for an explanation. How has the death of Christ brought us redemption when no one feels redeemed? In what way is Jesus a God-man and what is such a being? What is the Trinity about, and the parthenogenesis, the eating of the body and the drinking of the blood, and all the rest of it? What connection can there be between the world of such concepts and the everyday world whose material reality is the concern of natural science on the widest possible scale? For at least sixteen hours out of every twenty-four, we live exclusively in this every-day world, and the remaining eight we spend preferably in an unconscious condition. Where and when does anything take place to remind us even remotely of phenomena like angels, miraculous feedings, beatitudes, the resurrection of the dead, etc.? It was therefore something of a discovery to find that during the unconscious state of sleep intervals occur, called "dreams," which occasionally contain scenes having a not-inconsiderable resemblance to the motifs of mythology. For myths are miracle tales and treat of all those things that, very often, are also objects of belief. 11. Since knowledge of the world dwells in the adept's own bosom, [one] should draw such knowledge out of [one's] knowledge of [one's]self, for the Self [one] must seek to know is part of that nature which was bodied forth by God's original oneness with the world. It is manifestly not a knowledge of the nature of the ego, though this is far more convenient and is fondly confused with self-knowledge. For this reason, anyone who seriously tries to know [one]self as an object is accused of selfishness and eccentricity. But such knowledge has nothing to do with the ego's subjec-tive knowledge of itself. That is a dog chasing it's own tail. The other, on the contrary, is a difficult and morally exacting study of which so-called psychology knows nothing and the educated public very little. The alchemist, however, had at the very least an indirect inkling of it: he knew definitely that as part of the whole he had an image of the whole in himself. . . . This interior microcosm was the unwitting object of alchemical research. Today we would call it the collective unconscious, and we would describe it as objective because it is identical in all individuals and is therefore one. But out of this universal One, there is produced in every individual a subjective conscious, i.e., the ego (CW 9/2, par. 251). 12. This subjective knowledge of the self [is what is meant by]: "No one can know himself unless he knows what, and not who, he is, on what he depends, or whose he is (or to whom or what he belongs) and for what end he was made." This distinction . . . is crucial. . . . Not the subjective ego-consciousness of the psyche is meant, but the psyche itself as the unknown, unprejudiced object that still has to be investigated. . . . "What" refers to the neutral self, the objective fact of totality, since the ego is on the one hand causally "dependent on" or "belongs to" it, and on the other hand is directed toward it as to a goal (CW 9/2, par. 252). 13. We know only a small part of our psyches. The causal factors determining [one's] psychic existence reside largely in the unconscious processes outside consciousness , and in the same way there are final factors at work in [one] that likewise originate in the unconscious. . . . Causes and ends thus transcend consciousness to a degree that ought not to be underestimated, and this implies that their nature and action are unalterable and irreversible [to the degree that] they have not become objects of consciousness. They can only be corrected through conscious insight and moral determination, which is why self-knowledge, being so necessary, is feared so much (CW 9/2, par. 253). 14. The final factors at work in us are nothing other than those talents which "a certain nobleman" entrusted to his "servants," that they might trade with them (Luke 19:12 ff.). It does not require much imagination to see what this involvement in the ways of the world means in the moral sense. Only an infantile person can pretend that evil is not at work everywhere, and the more unconscious s/he is, the more the devil drives her/him. . . . Only ruthless self-knowledge o the widest scale, which sees good and evil in correct perspective and can weigh up the motives of human action, offers some guarantee that the end result will not turn out too badly (CW 9/2, par. 255). 15. We find the crucial importance of self-knowledge [for the sake of the transformation process] expressed most clearly [by the alchemist Dorn]. . . . The transformation is brought about by the conjunctio, which forms the essence of the work (CW 9/2, par. 256). 17. [From a comment on an alchemical tract, we learn] that the stone is implanted in [us] by God, that the laborant is its prima materia, that the extraction corresponds to the so-called divisio or separatio of the alchemical procedure, and that through [our] knowledge of the stone [we] remain inseparably bound to the self. The procedure here described could easily be understood as the realization of an unconscious content. . . . [W]ithout the existence of conscious concepts, apperception is . . . impossible (CW 9/2, par. 259). 18. The old master saw the alchemical opus as a kind of apocatastasis, the restoring of an initial state in an "eschatological" one ("the end looks like a beginning, and contrariwise"). This is exactly what happens in the individuation process, whether it takes the form of a Christian transformation ("Except ye become as little children"), or a satori experience in Zen ("Show me your original face"), or a psychological process of development in which the original propensity to wholeness becomes a conscious happening (CW 9/2, par. 260). 19. For the alchemist it was clear that the "centre," or what we would call the self, does not lie in the ego but is outside it, "in us" yet not "in our mind," being located rather in that which we unconsciously are, . . . which we still have to recognize. 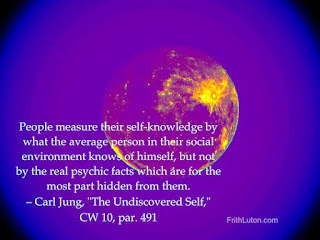 Today we would call it the unconscious, and we distinguish between a personal unconscious, which enables us to recognize the shadow, and an impersonal unconscious, which enables us to recognize the archetypal symbol of the self (CW 9/2, par. 261). 21. The symbols of the self arise in the depths of the body, and they express its materiality every bit as much as the perceiving consciousness. The symbol is thus a living body (from "The Psychology of the Child Archetype" in CW 9/1, par 291). 22. [The alchemist Gerhard] Dorn . . . says, "In the body of man there is hidden a certain substance of heavenly nature known to very few" (from "Psychology and Religion" in CW 11, page 93, note 47). 23. The old natural philosophers . . . said that the miraculous substance, whose essential nature they symbolized by a circle divided into four parts, was man himself (from "Psychology and Religion" in CW 11, par. 153). One might almost say that man himself, or his innermost soul, is the prisoner or the protected inhabitant of the mandala (from "Psychology and Religion" in CW 11, par. 157). 24. The spiritual man says to the worldly man, "Are you capable of knowing your soul in a complete manner? If you knew it, as is fitting, and if you knew what makes it better, you would be able to recognize that the names the philosophers formerly gave it are not its true names. . . . O dubious names that resemble the true names, what errors and agonies you have provoked among men!" The names refer in turn to the philosopher's stone. . . . (from "Psychology and Religion" in CW 11, par. 153). 25. [From an early treatise]: "Thus it [the stone] comes from man, and you are its mineral (raw material); in you it is found and from you it is extracted . . . and it remains inseparably in you"(from "Psychology and Religion" in CW 11, par. 153). 26. And Gerhard Dorn cries out, "Transform yourselves into living philosophical stones!" There can hardly be any doubt that not a few of those seekers had the dawning knowledge that the secret nature of the stone was man's own self. This "self" was evidently never thought of as an entity identical with the ego, and for this reason it was described as a "hidden nature" dwelling in inanimate matter, as a spirit, daemon, or fiery spark. By means of the philosophical opus, . . . this entity was freed from darkness and imprisonment, and finally it enjoyed a resurrection. . . . It is clear that these ideas can have nothing to do with the empirical ego, but are concerned with a "divine nature" quite distinct from it, and hence, psychologically speaking, with a consciousness-transcending content issuing from the realm of the unconscious (from "Psychology and Religion" in CW 11, par. 154). 27. The self is defined psychologically as the psychic totality of the individual. Anything that a [person] postulates as being a greater totality than [oneself] can become a symbol of the self. For this reason the symbol of the self is not always as total as the definition would require (from "A Psychological Approach to the Trinity" in CW 11, par. 232). 28. The goal of psychological, as of biological, development is self-realization or individuation. But since [we] know [our self] only as an ego, and the self, as a totality, is indescribable and indistinguishable from a God-image, self-realization . . . amounts to God's incarnation. . . . And because individuation is an heroic and often tragic task, the most difficult of all, it involves suffering, a passion of the ego: the ordinary empirical [person] we once were is burdened with the fate of losing one's self in a greater dimension and being robbed of [our] fancied freedom of will. [We] suffer, so to speak, by the violence done to [us] by the self. . . . The human and the divine suffering set up a relationship of complementarity with compensating effects. Through the Christ-symbol, , [we] can get to know the real meaning of [our] suffering, [and we are then] on [our] way toward realizing [our] wholeness. As the result of the integration of conscious and unconscious, [one's] ego enters the "divine" realm, where it participates in "God's suffering." The cause of the suffering is in both cases the same, namely "incarnation," which on the human level appears as "individuation." The divine hero born of [wo]man is already threatened with murder; he has nowhere to lay his head, and his death is a gruesome tragedy. The self is no mere concept or logical postulate; it is a psychic reality, only part of it conscious, while, for the rest, it embraces the life of the unconscious and is therefore inconceivable except in the form of symbols. The drama of the archetypal life of Christ describes in symbolic images the events in the conscious life - of a man who has been transformed by his higher destiny (from "A Psychological Approach to the Trinity" in CW 11, par. 233). 29. The symbols aiming at wholeness . . . are the remedy with whose help [illness] can be repaired by restoring to the conscious mind a spirit and an attitude which from time immemorial have been felt as solving and healing in their effects. They are "représentations collectives" [collective images] that facilitate the much needed union of conscious and unconscious. This union cannot be accomplished either intellectually or in a purely practical sense because in the former case the instincts rebel and in the latter case reason and morality. . . . [T]he conflict can only be resolved through the symbol. . . . The synthesis of conscious and unconscious can only be implemented by a conscious confrontation with the latter, and this is not possible unless one understands what the unconscious is saying. During this process we come upon the symbols . . . , and in coming to terms with them we reestablish the lost connection with ideas and feelings that make a synthesis of the personality possible (from "A Psychological Approach to the Trinity" in CW 11, par. 285). 30. The term "self" seems a suitable one for the unconscious substrate whose actual exponent in consciousness is the ego. The ego stands to the self as the moved to the mover, or as object to subject, because the determining factors that radiate outward from the self surround the ego on all sides and are therefore supraordinate to it. The self, like the unconscious, as an a priori existent out of which the ego evolves. It is, so to speak, an unconscious prefiguration of the ego. It is not I who create myself; rather, I happen to myself (from "Transformation Symbolism in the Mass" in CW 11, par. 391). 31. So long as the self is unconscious, it corresponds to Freud's superego and is a source of perpetual moral conflict. If, however, it is withdrawn from projection and is no longer identical with public opinion, then one is truly one's own yea and nay. The self then functions as a union of opposites and thus constitutes the most immediate experience of the Divine that it is psychologically possible to imagine (from "Transformation Symbolism in the Mass" in CW 11, par. 396). 32. Every sacrifice is . . . to a greater or lesser extent a self-sacrifice. The degree to which it is so depends on the significance of the gift. If it is of great value to me and touches my most personal feelings, I can be sure that in giving up my egoistic claim I shall challenge my ego personality to revolt. I can also be sure that the power that suppresses this claim, and thus suppresses me, must be the self. Hence it is the self that causes me to make the sacrifice; nay more, it compels me to make it . The self is the sacrificer, and I am the sacrificed gift, the human sacrifice (from "Transformation Symbolism in the Mass" in CW 11, par. 397). 33. [S]ince the relation of the ego to the self is like that of the son to the father, we can say that when the self calls on us to sacrifice ourselves, it is really carrying out the sacrificial act on itself. We know, more or less, what this act means to us, but what it means to the self is not so clear. As the self can only be comprehended by us in particular acts, but remains concealed from us as a whole because it is more comprehensive than we are, all we can do is draw conclusions from the little of the self that we can experience. We have seen that a sacrifice only takes place when we feel the self actually carrying it out in ourselves. We may also venture to surmise that insofar as the self stands to us in the relation of father to son, the self in some sort feels our sacrifice as a sacrifice of itself. From that sacrifice we gain ourselves - our "self" - for we have only what we give. But what does the self gain? We see it entering into manifestation, freeing itself from unconscious projection, and as it grips us, entering into our lives and so passing from unconsciousness into consciousness, from potentiality into actuality. What it is in the diffuse unconscious state we do not know; we only know that in becoming our self it has become [hu]man (from "Transformation Symbolism in the Mass" in CW 11, par. 398). 34. This process of becoming human is represented in dreams and inner images as the putting together of many scattered units, and sometimes as the gradual emergence and clarification of something that was always there. The speculations of alchemy, and also of some Gnostics, revolve around this process. It is likewise expressed in Christian Dogma, and more particularly in the transformation mystery of the Mass (from "Transformation Symbolism in the Mass" in CW 11, par. 399). 35. [T]he integration or humanization of the self is initiated from the conscious side by our making ourselves aware of our selfish aims; we examine our motives and try to form as complete and objective a picture as possible of our own nature. It is an act of self-recollection, a gathering together of what is scattered, of all the things in us that have never been properly related, and a coming to terms with oneself with a view to achieving full consciousness. (Unconscious self-sacrifice is merely an accident, not a moral act.) Self-recollection, however, is about the hardest and most repellent thing there is for [us], who are predominantly unconscious. Human nature has an invincible dread of becoming more conscious of itself. What nevertheless drives us to it is the self, which demands sacrifice by sacrificing itself to us. Conscious realization or the bringing together of the scattered parts is in one sense an act of the ego's will, but in another sense it is a spontaneous manifestation of the self, which was always there [insofar as it is the self that actuates the ego's self-recollection (note 19)]. Individuation appears, on the one hand, as the synthesis of a new unity that previously consisted of scattered particles, and on the other hand, as a revelation of something that existed before the ego and is in fact its father or creator and also its totality. Up to a point, we create the self by making ourselves conscious of our unconscious contents, and to that extent it is our son. This is why the alchemists called their incorruptible substance - which means precisely the self - the filius philosophorum. [son of the philosophers] But we are forced to make this effort by the unconscious presence of the self, which is all the time urging us to overcome our unconsciousness. From that point of view, the self is the father. This accounts for certain . . . psychological connections [that] are seen most clearly in the ancient conceptions of the Original Man, the protanthropos, and the "Son of Man." As the Logos, he is the world-creating principle. This corresponds with the relation of the self to consciousness, without which no world could be perceived at all. The logos is the real principium individuationis [principle of individuation] because everything proceeds from it and because everything that is, from crystal to [hu]man, exists only in individual form. In the infinite variety and differentiation of the phenomenal world is expressed the essence of the auctor rerum [author of things]. As a correspondence, we have on the one hand, the indefiniteness and unlimited extent of the unconscious self (despite its individuality and uniqueness), its creative relation to individual consciousness, and on the other hand, the individual human being as a mode of its manifestation. Ancient philosophy paralleled this idea with the legend of the dismembered Dionysus, who as creator, is the . . . undivided . . . and as the creature, [he is] the . . . divided. Dionysus is distributed throughout the whole of nature, and just as Zeus once devoured the throbbing heart of the god, so his worshippers tore wild animals to pieces in order to reintegrate his dismembered spirit. . . . The psychological equivalent of this is the integration of the self through conscious assimilation of the split-off contents. Self-recollection is a gathering together of the self (from "Transformation Symbolism in the Mass" in CW 11, par. 400). 36. Self-reflection, or - what comes to the same thing - the urge to individuation, gathers together what is scattered and multifarious and exalts it to the original of the One, the Primordial Man. In this way our existence as separate beings, our former ego nature, is abolished, the circle of consciousness is widened, and because the paradoxes have been made conscious, the sources of conflict are dried up (from "Transformation Symbolism in the Mass" in CW 11, par. 401). 37. The figure of the divine sacrificer corresponds, feature for feature, to the empirical modes of manifestation of the archetype that lies at the root of almost all known conceptions of God. This archetype is not merely a static image, but dynamic, full of movement. It is always a drama, whether in heaven, on earth, or in hell (from "Transformation Symbolism in the Mass" in CW 11, par. 402). 38. The words, "I will be united" must be understood . . . as meaning that subjective consciousness is united with an objective center, thus producing the unity of God and [hu]man represented by Christ. The self is brought into actuality through the concentration of the many upon the center, and the self wants this concentration. It is the subject and the object of the process. Therefore it is a "lamp" to those who "perceive" it. Its light is invisible if it is not perceived; it might just as well not exist. It is as dependent on being perceived as the act of perception is on light. . . . And just as a "door" opens to one who "knocks" on it, or a "way" opens out to the wayfarer who seeks it, so when you relate to your own (transcendental) center, you initiate a process of conscious development that leads to oneness and wholeness. You no longer see yourself as an isolated point on the periphery, but as the One in the center. Only subjective consciousness is isolated; when it relates to its center it is integrated into wholeness. Whoever joins in the dance sees him[her]self in the reflecting center, and his [or her] suffering is the suffering which the One who stands in the center "wills to suffer" (from "Transformation Symbolism in the Mass" in CW 11, par. 427). 39. As a totality, the self is by definition always a complexio oppositorum [union of opposites], and the more consciousness insists on its own luminous nature and lays claim to moral authority, the more the self will appear as something dark and menacing. (from "Answer to Job" in CW 11, par. 716). 40. Insofar as this process [of individuation], as a rule, runs its course unconsciously as it has from time immemorial, it means no more than that the acorn becomes an oak, the calf a cow, and the child an adult. But if the individuation process is made conscious, consciousness must confront the unconscious and a balance between the opposites must be found (from "Answer to Job" in CW 11, par. 755). 41. The difference between the "natural" individuation process, which runs its course unconsciously, and the one that is consciously realized is tremendous. In the first case, consciousness nowhere intervenes; the end remains as dark as the beginning. In the second case, so much darkness comes to light that the personality is permeated with light and consciousness necessarily gains in scope and insight. The encounter between conscious and unconscious has to ensure that the light that shines in the darkness is not only comprehended by the darkness, but comprehends it (from "Answer to Job" in CW 11, par. 756). This site contains copyrighted material the use of which has not always been specifically authorized by the copyright owner. We are making such material available in our efforts to advance understanding of environmental, political, human rights, economic, democracy, scientific, and social justice issues, etc. We believe this constitutes a 'fair use' of any such copyrighted material as provided for in section 107 of the US Copyright Law. In accordance with Title 17 U.S.C. The material on this site is distributed without profit to those who have expressed a prior interest in receiving the included information for research and educational purposes. If you wish to use copyrighted material from this site for purposes of your own that go beyond 'fair use', you must obtain permission from the copyright owner. All readers of this blog are encouraged to visit Bollingen Princeton University Press and consider purchasing books related to the Life, Work and Legacy of C.G. Jung.